As has been discussed previously on The Source, Metro is preparing to begin latching gates at Red and Purple Line subway stations beginning this summer, with gates at other Metro Rail stations to be latched subsequently. All Metro riders will need to ‘tap’ their TAP cards to get through the gates. That, of course, is an issue for Metrolink passengers who get free transfers to Metro as part of their fares — Metrolink uses paper tickets, not the plastic “TAP” cards that have become the norm on Metro. In order for Metrolink passengers to get through latched gates, Metrolink and Metro have worked together to develop paper TAP cards for Metrolink customers. The following has been posted to Metrolink’s website and explains the transition from the current ticketing system to TAP-enabled paper tickets. Bottom line: The TAP-enabled Metrolink tickets for destinations in Los Angeles County (the area served by Metro) will be available through Metrolink ticket machines and for those purchasing Metrolink monthly passes. Metrolink customers will have to ‘tap’ those tickets when using Metro Rail and will continue to show their tickets to bus operators on Metro bus lines. Metrolink and Metro have worked collaboratively to create a Metrolink ticket that is compatible with the Metro TAP system. TAP-enabled tickets will be dispensed from Metrolink Ticket Vending Machines (TVMs) to allow passage through Metro’s turnstiles leading to Metro rails lines and stations. All Metrolink tickets with Los Angeles County destinations will be TAP-compatible, and all riders will be required to physically tap their tickets at the turnstiles and validators when transferring to a Metro Rail line. When boarding a bus, the current policy of simply showing the bus operator your Metrolink ticket will still be in effect. Tapping is not required on buses. Metrolink riders will also experience a change in the timeframe where they can purchase monthly passes. In an additional measure to reduce fare evasion, the new Monthly Passes will only be available for purchase starting the 25th of the current month through the 5th of the new month beginning in May. A Metrolink TAP enabled ticket is a new ticket that provides customers with access through Metro Rail turnstiles and validators. All ticket types will be TAP enabled. A TAP enabled or compatible ticket has a “smart chip” and antenna embedded into the ticket. The “smart chip” technology lets you have a seamless transfer to Metro Rail. TAP enabled tickets have a TAP logo on the upper right corner to distinguish the new tickets from the old. The “smart chip” and antenna are built into the paper ticket near the TAP logo on all ticket types. The signal is strongest when the TAP logo is placed on the TAP reader at a station turnstile or validator. The “smart chip” and antenna are used to unlatch the turnstile. Bending or folding the ticket may damage the “smart chip” and antenna, so please do not bend. I went to one Ticket Vending Machine (TVM) and received one version of ticket stock and on another day, I received another, what do I do? Do I still need to TAP? Metrolink is transitioning its ticket stock. Some of the older ticket stock will be utilized while we transition. If you have ticket stock shown below you do not need to TAP. There is no antenna in the older ticket stock. However, if you receive the new stock (identified with a TAP logo) you must TAP at the turnstile or validator. When will the turnstiles be latched? The latching should be complete by the Summer (2013). However, if you have a Metrolink ticket with a TAP logo in the upper right hand corner, you must tap to validate your ticket. Metro installed turnstiles at many of its Metro Rail stations and is completing the process by latching them. In order for Metrolink passengers to pass through the latched turnstile, they must physically tap the “smart chip” ticket to unlatch the turnstile before walking through. Why did Metrolink change the Monthly Pass sales period to the 25ththrough the 5th of the following month? 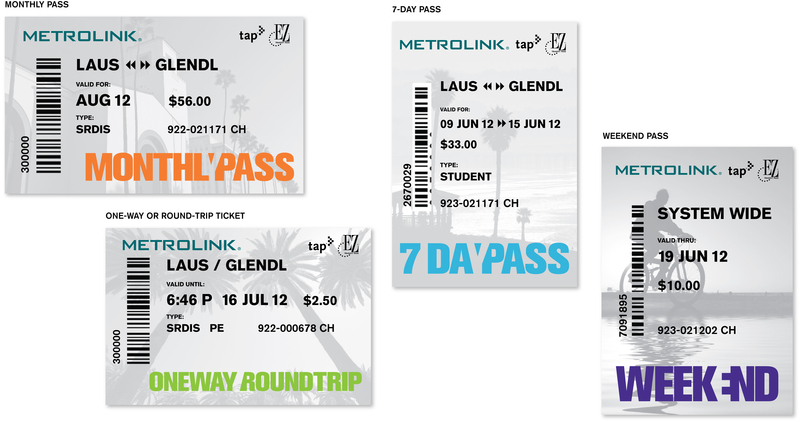 Metrolink changed the pass sales period for Monthly Passes to conform to preprogrammed TAP transfers. If you miss the window to purchase a Monthly Pass, please purchase a 7-day Pass. Is this new technology costing me anything? No, there has been no increase in cost to the passenger. You are only allowed to ride on Metrolink for the calendar month identified on the pass. The TAP reader may display a date beyond the current calendar month however you are not allowed to ride the Metro system beyond the last day of the calendar month printed on the pass. Tickets and passes are available all the time, however, Monthly Passes will only be sold on the 25th to the 5th of the following month. Monthly Passes will not be available outside of this window. Can I purchase a Monthly Pass outside of the designated dates (25th to the 5th) if I am not traveling between station pairs in L.A. County? No, Monthly Passes will only be available from the 25th to the 5th of the following month. Does my Corporate Quick Card allow me to redeem my Monthly Pass from the TVM outside of the 25th to the 5th of the month? No, Monthly Passes will only be available from the 25th to the 5th of the following month. All other tickets and passes are available at any time through the Corporate Quick Card. All the Monthly, 7-Day, Weekend Passes and certain One-Way/Round Trip Tickets will have the smart chips in them. Only the One-Way/Round Trip Tickets not coming into Los Angeles area will be without. Why is Metrolink still not using TAP?!! This whole confusion would be solved if everybody got onboard with one standard technology!!! Look at San Francisco. Everyone’s on board ClipperCard from Caltrain, MUNI, and BART. Look at London. Everyone is onboard with Oyster from Underground to London buses, Overground, river boats, and even some National Rail. Look at Tokyo. Everyone is onboard the Suica and PASMO and can be used to ride trains, subways, buses, even used for taxis and even buy stuff at convenience stores. And look at LA. We spent so much money on TAP and so many years trying to figure this out and it has been a total waste of time riddled with inefficiencies and problems. While the rest of the world zooms us by with cutting edge technology, LA still continue to scratch our heads years and years on how to figure out a simple thing like how to get TAP to work. And LA fails miserably at it. We must be the joke of public transit around the world. Your frustrations are justified. It *has* been 20 years since the Metrocard was created to begin to create a regional fare clearinghouse. Many, many, many mistakes have been made since then. In these “72 suburbs in search of a city” as Dorothy Parker so abtly described greater Los Angeles, reigning in the various fiefdoms that have already created their own transit systems has been very difficult. The cities you mention all have or have one time had strong regional governments under which the framework for a regional fare system could be created. London and Tokyo function as subsets of national government. Los Angeles and its “72 suburbs” exist with little or no actual realtion to the Federal Government (apart from the various grants and funding that they have allowed themselves to become dependent upon, but that’s for another discussion). San Francisco has always had a more cohesive regional policy about fares due to the tremendous overlapping of its systems and agencies (and the natural choke-points created by water, peninsula and later the bridges.) San Francisco also has a state created regional transportation planning agency (The MTC) that is also the federally-designated Metropolitan Planning Organization. This has allowed the MTC, which is *not* a transportation system operator, to both create and expand the Translink-now-Clipper-Card system without any real bias towards its own transit operations, because it has none. Also, being the MPO, it has various sticks and carrots available to it to get systems to comply and cooperate with, namely cash. And the MTC is run by a commission that does not automatically include all the councilmembers or supervisors of one or all the counties in the Bay Area. So pet peeves like Yvonne Burke’s “My constituents are ending up on the platform without knowing it” one that led to the installation of the turnstiles in the first place are harder to push through. In Los Angeles, the reality is that SCAG is the MPO, while LA Metro is the regional transportation agency. And it is an operator of a good deal of the transit operations in the county. And it was not very good at creating a level of trust when key implementation time-points where mishandled so that other agencies lost faith in the TAP card system. But…now this is past, and the people who are implementing the TAP card are doing a good job to rectify the situation and get the program implemented. Give them a chance. A regional fare policy may follow, and also it may very well be possible to use a Plastic TAP card to ride on Metrolink in the near future. The problem with Metrolink is that if it ever goes to TAP, it will need a TAP-in and TAP-out system since it’s on a distance based fare system. BART had no problem going from paper tickets to Translink to Clippercard because they already had the gates at all their stations under their distance based fare system where they could read paper magnetic stripe cards and eventually do tap-in and tap-out. Metrolink doesn’t have that and it’ll take a significant amount of investment to install those at all Metrolink stations. Heck, even Metro doesn’t have gates and turnstiles in all of their stations either. Everything is a mess down here in LA due to lack of coordination, lack of foresight, and lack of standardization. It’s always “build, build, build” and “think about the most basic and important stuff later” which ends up costing us more down the road since we have more stations to think about now. What we need is a real transit leader who is able to work independently apart from politicians and government bureaucrats and give him/her full authority in decision making. I say we might as well headhunt a qualified transit experts from abroad and make him/her the public transit tsar of LA. That’s how we fixed LAPD, by bringing in an outsider. Might as well do that with public transit in LA. You said it yourself that Metro had 20 years to get this done right. Twenty years of multiple incompetent government workers being paid six figure incomes from our tax dollars to get this thing in order. How many millions of dollars was wasted in this thing throughout the years? And how many more years is it going to get to fix this? Another twenty years? Another millions of tax payer dollars down the drain? The rest of the world is already using cell phones to pay for their fares!! They are using contactless credit and debit cards to ride the bus!! They are already decades ahead by upgrading their systems to near-field communications technology!! And what are we doing? Still using cash. Still using paper passes. And the in-between solution is this sorta-like TAP but not thing. And TAP doesn’t even work right. Taptogo.net is a total complete mess of a website design. By the time we finally figured out how to do TAP in 2033 at the best, the rest of the world will already be using better technologies. Look at it this way: Google went from two guys in Stanford working in a garage to being a terminology on the Oxford English Language Dictionary and being a multi-billion dollar darling child for Silicon Valley in 15 years. And Metro can’t even get a regional fare plan and TAP right during that time. Doesn’t that illustrate a fine example of how government workers can’t get anything right? Running rail without a fare gate is like running them in an honor system. It’s not going to work. Look at what the honor system did to LA Metro. It made it a complete mess. I don’t know what the difficulty is. If you want to ride a train, you go through a fare gate. IT’S SIMPLE AS THAT! That how every other country in the world that gets transit right does it! Doesn’t anyone in Metro ever visit cities that get transit right? You’d think being a transit agency, they would be copying other cities who get transit right. But noooo, LA likes to do things differently. And they keep screwing it up big time trying to reinvent the wheel. Just install fare gates across the system, including all Metrolink stations, and all stations that are to be built in the future. It’s literally simple as that. I honestly don’t know what the problem is. I traveled through Union Station on Monday and I was very happy to see the flyers announcing that Metrolink would be getting paper tickets which can handle a Metro Rail gate. I do agree that gates would be better, but I also feel that electric beats diesel and grade-separation beats crossings. There are economic and political reasons why this hasn’t happened yet, sadly. However, there is no technical reason why they can’t have TAP pylons at the stations or even on the trains (near the doors, so you would have to pass by a reader as you enter and as you exit).